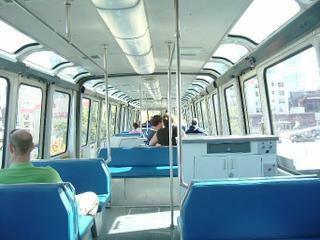 I recently rode the old monorail in Seattle. It looks like the new, larger monorail is in trouble. Mayor and city council don't think the financing plan is realistic. A scaled back monorail plan is on the ballot. Here is an idea for the monorail, as if they don't have enough suggestions already. Turn the new monorail into a "feeder line" for Sound Transit. Sound Transit is Seattle's other light rail proposal. It has had problems and cost overruns as well. Sound Transit has also had to scale back it's original plan. The original "phase 1" plan called for going from the airport to University of Washington, possibly even on to Northgate. It has been scaled back to a line just from the airport to downtown. At least Sound Transit is starting to build that line. The original monorail plan sort of paralleled Sound Transit. It went from West Seattle, (down the airport direction) through downtown and up to Ballard District. That's sort of the direction toward University Of Washington. Why can't they merge the two plans? Let Sound Transit build it's line from the Airport to downtown. Then have a scaled back monorail line from downtown to University of Washington (where Sound Transit had originally planned to go). Another short monorail line could link West Seattle to the Sound Transit line that comes up from the southwest, rather than having to go downtown. The monorail could become a feeder line to Sound Transit. They should share a downtown station so passengers can easily transfer from one to the other. Both lines could gradually branch out from that hub and connect with metro transit bus routes. People tend to forget, but Sound Transit already has another rail service that links both Everett and Tacoma to Seattle. It's called the Sounder Train. Runs on existing BNSF right of way. Tacoma already has a short Sound Transit light rail line in it's downtown area. All these things should start connecting up, but people may have to transfer from bus to train to monorail, for instance. One fare should cover it all. Maybe it's not a perfect idea, but it's better than sitting in traffic. Part of the problem, with any transportation system, is the staggering cost of land in Seattle area. Houses that sold for $20,000, not that many years ago, now sell for closer to the million mark. It must be next to impossible to do any public works project, such as building stations, that requires buying land. This problem especially makes adding lanes to the existing freeway impractical. If one thinks light rail is too expensive, just try adding another lane to I-5! It would take up so much room and displace so many homeowners that the bank breaks. So, Sound Transit and Monorail should get together. It's just another one of my ideas. The Seattle Monorail is a fun, short ride, but as a transportation alternative it is a tremendous waste of resources. Why spend billions of dollars to elevate a light rail line so as not to interfere with automobile traffic? Cars are a rapidly obsolescing form of transport, doomed by the approaching peak in global oil production to become far too expensive to operate. Light rail is only expensive when the infrastructure has to elevate or burrow to accomodate cars. Better to use existing right of ways for rail (e.g. freeway lanes, surface streets, and the abandoned BNSF line that parallels I-405 and is currently used by only the "Spirit of Washington" Dinner Train in the evenings), and pay for any problems with at-grade crossings out of the budget for auto infrastructure instead of having light rail have to pay for cars to cross rail lines safely. It is such a waste of resources to keep pouring money into auto infrastructure, and it serves to discourage mass transit. If we stop widening roads for cars and let drivers sit in jams choking on their own exhaust, bus and rail ridership will increase dramatically. Can't wait to see your vacation pics! Sound Transit's line to airport as well as most of Portland's Max lines may be the smartest idea. Just take up a lane and go down the street. At least I think that is what the non tunneling south leg of Sound Transit does. Yes the Lake Washington Dinner Train occupies a great corridor. It has potential. As for mail order brides, there are advertising bots that leave posts now. I decided to remove some of those automated posts. Also I have activated a new word image verification step, that Blogger provides, to help filter out the machines and keep the posts from people. The Seattle Monorail was build for the World's Fair in 1960 - so it was NEVER economically justifable. The proposed regional monorail system began as the child of promoters and laymen - and still suffers from their ministrations. Their claims of lower costs, less disruption, etc are proving false. It's a shame they pulled the region into a boondoggle and negatively impacted the real transit project (light rail) in the process. Best case scenario - salvage the usable routes and revisit the technology choice. I've always looked at monorails as a futurama fun demonstration, but as fairly impractical as a "technology." Rail systems including elevated systems are capable of switching tracks to enable traffic to detour around a disabled train. Switching also enables conventional rail trains to select routes at Y or intersections, so one high volume track can handle trains to many destinations. Building a system that locks trains to a single track in more or less a closed system just seems to limit the economic viability. Or, does someone have diagrams of monorail systems that can change tracks? but they've worked through them pretty well, and I think they do have a proven means of funding. cancelled, they haven't returned it but instead are selling it for twice what they gave the owners. area to get over that monorail failure, I think. Yes, I hear that the Monorail is selling condemned property for much more. Making some folks mad. Part of the problem is the incredible rise in Seattle property values. Maybe they should have given the former owners first rights to buy the land back, but they were not planning for the monorail to go belly up. They never realized that they would be unloading the property again. They must have not drawn up "first right to repurchase back" contracts at the time they condemned and purchased the properties. Now they are trying to get the most bang for the buck by selling for what the market bears. If they make a profit on the property sales, they pay off their outstanding debt faster. There are also a lot of people who are mad at the monorail because the tax is still being imposed even though the monorail is not being built. The tax will stay on until all the outstanding debt is paid. Profit from property unloading helps them retire the debt faster. the layout in your blog. Is this a paid theme or did you modify it yourself? is truly nice, every one be capable of simply be aware of it, Thanks a lot. Not a lot of work. I'm not adding much to my blog recently, but using Facebook more instead. Feel free to quote from and link back to my blog if you wish.